After almost nine years on the road, New Horizons is in what NASA calls “Pluto-space”! Earlier today (July 7), the spacecraft Twitter account announced New Horizons is now 29.8 Earth-sun distances (astronomical units) away from the Sun, putting it within the boundaries of Pluto’s eccentric orbit — exciting, since Pluto is the primary science target. “Didn’t get the word? We’re farther out than Pluto’s minimum distance to the Sun. We’re in ‘Pluto-space’ now!” tweeted the New Horizons account. We’ve included some of the best Pluto pictures below, to date, to celebrate. And while many are focused on the Pluto encounter itself, NASA is already planning for what to do next for the spacecraft. In mid-June, we reported that the Hubble Space Telescope was doing a test search for icy Kuiper Belt objects that New Horizons could possibly fly to next. That test search was successful enough, with two objects found, that Hubble is now doing a full-blown investigation, according to an announcement last week. Hubble will begin that work in July and conclude observations in August. 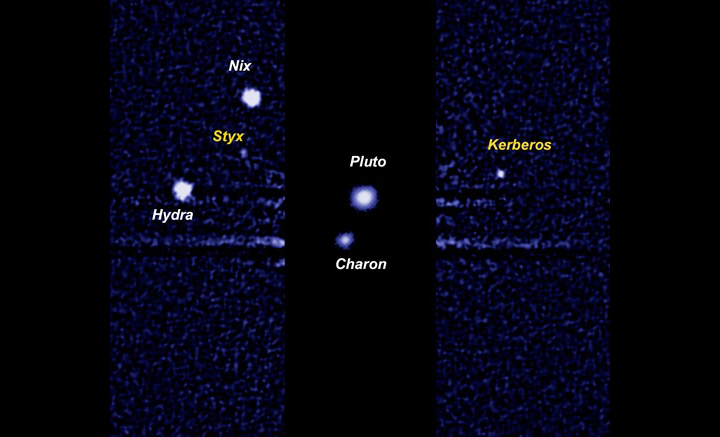 New Horizons is expected to fly by Pluto and its moons in July 2015. Where does it say they found two objects? You have a typo on the third pic from the end. The moon of Eris is Dysnomia, not Dysmonia. I can’t wait to see updated images from New Horizons. I’m sure they will show lots of interesting things that will probably take a while for us to fully understand. …and in one of the image captions, it should be “Styx”, not “Styz”. Sadly, the author will Not read the comments, Nor correct the typos. Otherwise, it is nice to get updates on New Horizons’ progress. Sorry about the typos — they are both fixed! I have been following this via twitter. oh man i’m looking forward to those first pics. i know it’s not even a “planet” now but i grew up with it as one and it will always have extra prestige in my mind when compared with other KBOs. It IS a planet, at least according to the equally legitimate geophysical planet definition, which does not require an object to clear its orbit to be a planet. This definition is the one supported by New Horizons Principal Investigator Dr. Alan Stern and many members of the mission team. In fact, Stern is the person who first coined the term “dwarf planet,” but he intended it to refer to a third class of planets in addition to terrestrials and jovians, not to refer to non-planets. Pluto is both a planet and a KBO. The first tells us what it is; the second tells us where it is. They are not mutually exclusive. So exciting. And very glad effort was made back in the last decade to make this mission a reality. It will be quite the flyby. Also, New Horizon’s message in a bottle initiative will be part of the post-Pluto phase thanks to many signatures secured over the past year from around the world. Kudos to Jon Lomberg. I think it is great that I finally get to see an image from 2013, but shouldn’t we be seeing one if not some image(s) from 2014 by now? It would be nice if we could at least get one image per month until New Horizons reaches Pluto, since this is the 1st time we are going there (Pluto that is) specifically. It’s not just science, but an historical mission besides………..